Lessons from the Grenfell fire tragedy; an existing and drastic shortage of appropriately and suitably skilled workers – likely to be exacerbated by approximately 10% by Brexit; and the closure of many of the industry’s specialised apprenticeship centres are fuelling a training revolution. There was a significant drop in the money invested in training by the sector’s employers following the 2008 financial crash and the effects of this are now being seen. At the same time, main contractors are stepping up how they permit access to their sites as a result of the requirements of the Construction Leadership Council and questions raised by the Grenfell inquiry’s damning assessment of the industry’s competence levels. Workforce research carried out by BESA two years ago identified a growth in the number of people entering the industry with basic domestic plumbing qualifications, but an acute shortage of those with the higher, specialised engineering skills needed by most employers. As a result, according to Mr Howard, many workers have been working on sites without the right qualifications. The latest figures from the Office of National Statistics (ONS) revealed a record 810,000 vacancies in the country’s employment market of which 29,000 are in construction-related professions. Unemployment is at a 40-year low of 4.4% and one in 10 migrant workers is expected to go home next year when we leave the EU, further to what is being described as a skills ‘chasm’. Employers have a shrinking pool from which to recruit. On top of this, many of the building engineering sector’s specialist training providers have closed due to lack of demand. “Employer ability to train due to financial uncertainty and payment retentions meant this crunch was always coming. The Grenfell inquiry has highlighted it,” says Mr Howard. These are designed to equip new entrants and, where appropriate, existing workers with a qualification for life that is properly assessed at the outset for its suitability for the modern workplace. It can be regularly re-assessed and updated in line with technical and technological developments through continuous professional development and specific targeted short courses. 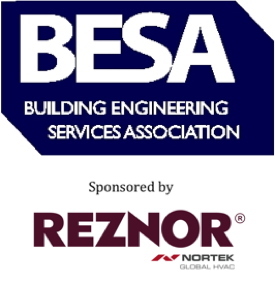 BESA members were responsible for the development of six of the New Standards available in construction and more are now expected as a result of the Institute for Apprenticeships’ stated determination to increase the pace of approval. These will become the starting point for qualifications that will be regularly reviewed and re-assessed throughout an engineer’s working life. They will be backed up by end point assessments to ensure candidates have developed the necessary knowledge, skills and behaviours to equip them for the ‘real world’ of work. As well as being a registered training organisation able to operate across England, Scotland, Wales and soon Northern Ireland, BESA Training has also been appointed as a Registered End Point Assessment Organisation (RoEPAO), which allows it to assess new training standards in England. The assessment involves a series of interviews and practical assessments where students are examined – independent of their training provider – and this should give employers greater peace of mind that they are receiving apprentices with fully rounded competence ready for productive work. BESA is currently the only end point assessment organisation for these standards. Previously, the system was based on continuous assessment, but employers often felt there were weaknesses in that approach, according to Mr Howard. “BESA members often told us that they were doubtful whether the previous system of assessment was actually very useful,” he says. “The assessments were carried out by the trainers, whose employers were incentivised to ensure all of their candidates completed the courses successfully. “Setting new standards in apprenticeships, backed up by meaningful end point assessment, is the starting point for the qualification for life model that allows skills to be regularly refreshed via continuous professional development (CPD) and targeted specific short courses. Another positive development was the news that, from April, companies who pay into the Apprenticeship Levy can share their training funds with other employers and training agencies. The National Apprenticeship Service has confirmed that these larger employers will be able to transfer up to 10% of their Levy money every year to other parties. As well as unlocking desperatelyneeded funding for apprentices, this should also encourage greater supply chain collaboration to address specific skills shortages. Levy-paying employers will only transfer funds once they have agreed the type of apprenticeship being supported with the receiving company or organisation. This is intended to address the criticism that funds are not always being directed into areas of the greatest need. “This is an amazing opportunity not to be missed and I would urge all employers to get into dialogue with their supply chain partners about how they can make best use of these vital funds,” says Mr Howard.